If there is something that we can all agree on, it is that brunch is an easy decision for a late weekend morning. I mean, it is a beautiful idea. Mixing breakfast (the best meal of the day in my opinion) with lunch (to appease the non-breakfast loving people) plus adding the option of an alcoholic beverage – I think you have all of your bases covered. The hard decision starts when the brunch options start getting thrown out. Now, being the food snob that I am, I won’t go just anywhere - but I try to appease others too. Luckily, Iowa City has options that will make everyone in your crew happy. If you&apos;re looking for a traditional diner style, there are two great stops for you. 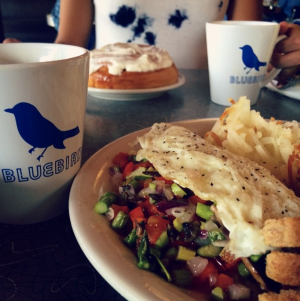 Bluebird Diner – This is my personal diner favorite, especially because the coffee is served in a staple Bluebird mug. You might even be tempted to start with a ginormous cinnamon roll, but just be aware that your breakfast will be accompanied by a mountain of hash browns, toast and of course a few containers of Smuckers jelly. Want to eat until you drop? Here are the two for you. Iowa River Power – This should be number one on your list if you are looking to treat yourself. Book a reservation and request a window side table to get a view of the river. You’ll be able to stack your plate with freshly carved prime rib, a homemade Belgium waffle and an array of desserts all at one time. Blackstone – If you can’t make a decision between lunch or breakfast, then this brunch line is the answer to your dreams. Blackstone will serve up its famous mac &apos;n cheese alongside scrambled eggs, sliders, crepes and so much more. Plus, for $8 more, the staff will keep the mimosas coming too. Want something a little bit on the wild side? This is where Iowa City peaks. Pullman – I was tempted to keep this guy with the diners; however, it’s not your traditional diner - it’s a little more “high-class.” I’ve had almost everything on this brunch menu and have never been disappointed, from eggs benedict and trendy avocado toast to breakfast tacos and my all-time favorite mo burger. If you have questions, trust me…all you have to know is bacon jam. Goosetown Café – Although this is on the newer side, get a blast from the past and grab yourself a poptart. You heard that right, homemade poptarts – as well as dutch baby pancakes. It’s like grandma’s kitchen…just a bit more updated. The Dandy Lion – This café has all of your go-to breakfast picks with a twist, like French toast made with house made Hawaiian loaf. This joint is full of house-made baked goods including cinnamon rolls and donuts! Don’t let the ped-mall construction steer you away from this one. Marquee – Another semi-new kid on the block. 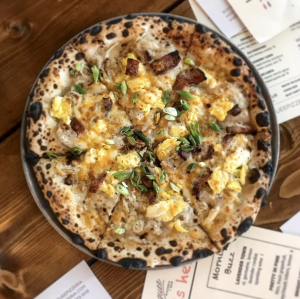 Its brunch menu features highlighted items from the normal menu such as a breakfast sandwich, chicken and waffles, and not just one, but two breakfast pizzas. Pro tip – ask for the fancy sauce on the side to dip your crust in. Now, who wants to go get some brunch? Rachael Bedell grew up in Dallas, Texas – although she doesn’t have an accent, her “y'all” will definitely give her away. Rachael made her way to the Midwest to attend and play volleyball at the University of Iowa and never looked back. Rachael is now the Assistant Director of Marketing at the University of Iowa. Although she sleeps and breathes Hawkeye Athletics, she eats practically everything else. Her true love is pizza, but she won’t shy away from any food.